Why is it that swarms of small creatures such as ants can accomplish big tasks? How are they able to kill a large insect or even a small animal and then bring it into their nest? It turns out the answer to this question is one that can be applied to the world of robotics. Scientists and engineers are programming robots with this swarming ability in order to study how a very simple machine in large numbers can accomplish a complex job. Two examples of bots used in swarm robotics are Kilobots and bionic ants. 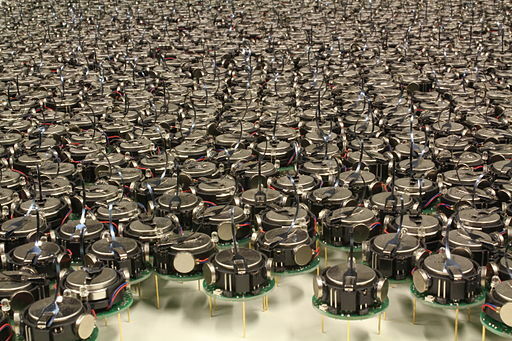 Researchers at Harvard University built a Kilobot for swarm robotics research for $14 a robot. Usually to have a robot this size for study is very expensive per robot, but they managed to do it for very low cost per unit. In their paper on the Kilibot, they explain where and how they were able to cut cost and yet, still be able to have an effective robot for research. The robot uses vibration for movement, and is powered by a coin cell battery. Check out the site for some interesting video demonstrations of their 25 Kilobots. Another group that has experimented with swarm robotics is Festo. They invented bionic ants and have created a Bionic Learning Network. By using the models that nature provides, Festo is developing the technology to aid in the automation of factories. Festo has created a fleet of bionic ants capable of working together, as well as function on their own, in order to complete tasks, just as their real-life counterparts do, according to Business Insider. One major theme of swarm robotics development continues to be the idea of using nature as the model for new and innovative types of swarm robots. Most of the ideas come from biomimicry or biomimetics. Biomimetics is the science or practice of using living creatures as inspiration for mechanical design. The end result is that there seems to be no end to the types of bots that can be built using nature as a blueprint. What is your opinion about swarm robotics? What other applications besides those presented here could they be used in? Please write your comments to this post and let me know what you think. For more ideas of what these bots are good for, check out this post by Mike Henry.